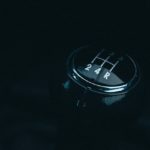 “Shift the gear” Got thrills?, Of Course you do, we the automobile enthusiasts always get goose bumps when it comes to gear up or gear down, but ever wonder how is it done? What happen when we pull or push the gear lever? Why there is some cars with no clutch pedals? What makes a transmission automatic? Let’s just find out. A gearbox is a transmission device which is used between engine’s output shaft and the final drive in order to transfer required torque and power to the wheels of the vehicle, a gearbox consists of the set of gears( i.e. spur, helical, bevel, worm and epicycle depending on the types of gearbox used )which are arranged in a special fashion in order to provide required gear or speed ratios to the final drive of the vehicle, a gearbox usually comes with the specification i.e.5-speed transmission with a reverse, and an automatic transmission. Why do we need Gearbox? 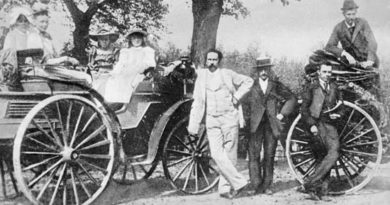 The need of different torque and different speed due to the continuously change in road conditions has led us to the development of the intermediate device that can provide different speed or gear ratios in order to keep the vehicle moving. 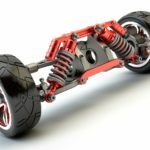 When a car starts ,the torque provided by the engine output shaft is not enough to overcome the weight of the vehicle which make it difficult to move the car initially, so to solve this problem a gearbox is required which can provide high torque initially in order to move the vehicle. When we go to the hill station it is essential that the vehicle should be equipped with device that can provide a wide range of high torque, to fulfill this need a gearbox is required so that a vehicle can go to the hills. When a vehicle is going at high speed, torque is not at all effective so a gearbox is needed that can also provide a high speed low torque ratio so that vehicle can maintain the high speed. In a race car continuous change of gears from high torque to high speed is there due to the curvy track so the race car should be equipped with a suitable gearbox so that shifting of gears is smooth and easy. In India there is always a problem of traffic so continuous change of gears manually that requires continuous pressing of clutch pedal causes fatigue to the driver, so there is a need of automatic transmission. It is the shaft used as an output shaft in a gearbox, this shaft is usually kept parallel to the lay shaft and in front of the clutch shaft or engine output shaft, the change of gear usually occur through this shaft as it is usually connected to gear lever. 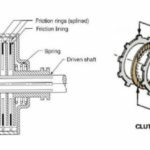 It is the shaft which carries the engine output to the gearbox, the engaging and disengaging of the engine output occurs with the help of clutch. 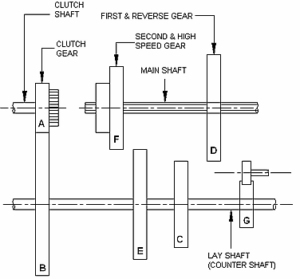 It is the shaft through which the output of the engine is transferred to the main shaft by the continuous meshing of a gear on the lay shaft to the gear on the clutch shaft. They are the connecting circles with teeth that rotates and meshes with another gear on the different shaft in order to transmit the circular motion between 2 different shafts, they can be –spur gear, helical gear, bevel gear and worm gear. They are the special devices used in modern gearbox (synchromesh gearbox) that makes the shifting of gears smooth by bringing the speed of main-shaft, lay-shaft and clutch-shaft at the same, they doesn’t have to slide over the shaft for the shifting of the gear. They were used in old gear boxes like constant mesh gearbox, to avoid the sliding of gear over the shaft for meshing or shifting. As they slide over the shaft in order to shift a gear. 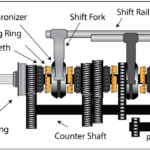 It is the lever operated by the driver to change or shift the gear, the movement of the lever is designed in a particular fashion. 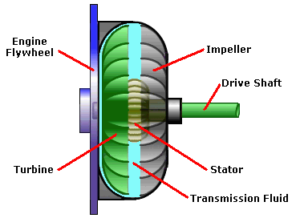 Note – In automatic gear box, epicyclic gear train is used so there is no use of any dog clutches or synchromesh devices and also in hydraulic coupling or torque converter the parts used are totally different as in this stator, impeller, highly compressed fluid and turbine is used that provides the different speed and torque, so there is no use of gears at all. A manual transmission is the types of gearbox used in most of the vehicle on the road due to its low cost. It is the type of gearbox in which there are limited gear or speed ratios i.e. maximum of 6- speed and 1- reverse is there, and the shifting of gears is a manual task performs by the driver by pushing or pulling the gear lever in predefined fashion. Manual transmission always requires the use of clutch. It is the oldest types of gearbox used, in sliding mesh gearbox the gears of main shaft and lay shaft are not in mesh i.e. 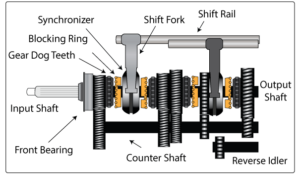 independent, only a single gear is in continuous mesh with the gear on the clutch shaft that rotates the lay-shaft and the meshing of gears with the appropriate gear on the lay shaft occurs due to the left or right siding of the gears of the main-shaft. 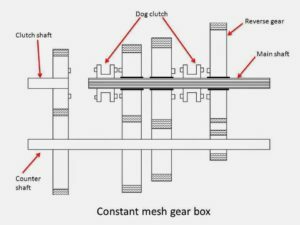 Note – Sliding mesh requires special technique for shifting of gears which is known as double-de-clutching. It is the modified gearbox introduced to overcome the limitations of the sliding mesh gearbox. In this types of gearbox all the gears of the lay-shaft, main-shaft and clutch shaft are in constant mesh with each other and the shifting of gear is obtained by the sliding of dog clutches over the splined main shaft in order to obtain high speed or torque output. 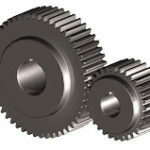 Note – Constant mesh gearbox overcomes the problem of double-de-clutching but the shifting of gear is noisy and still not smooth because the speed of the lay shaft, main-shaft and clutch shaft is not same at the time of shifting. 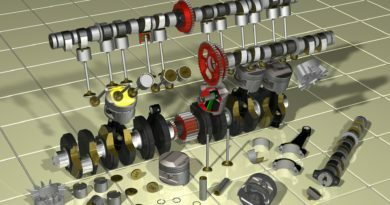 This is the latest of all types of manual gearbox which provides the smooth and quiet shifting of gears due to the use of special devices known as synchromesh devices, these devices helps in bringing the speed of all the shafts to the same (using frictional contact) before the meshing of the appropriate gears which causes less wear and tear to the gears. It is used in high-end cars due to its high cost, in this types of gearbox infinite gear ratios can be obtained by just pressing the accelerator, the driver just need to select the mode of the drive i.e. forward or reverse, park, neutral, drive and sport, and the required gear ratios along with the timing of the meshing is obtained automatically. Automatic gearbox doesn’t require clutch pedal, so all the cars with automatic transmissions comes with only 2 pedals. 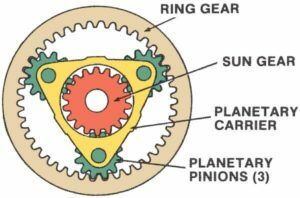 In this type the shifting of gear or the different gear ratios is obtained by making any one of the gears that are sun gear, planetary gears and the ring gear constant by the mean of breaking band which is operated by the accelerator pedal. It is the special type of the automatic gearbox that is based on the fluid coupling, in this type an impeller, a turbine, a highly compressed fluid and a stator is used for obtaining the different speed or gear ratios that is controlled by the accelerator pedal. 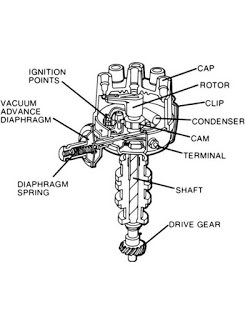 The impeller of the torque convertor is connected to the engine shaft, the turbine is connected to the output shaft and the stator is placed in between these two to direct the flow of the fluid. 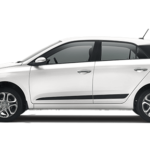 5-speed 1-reverse manual transmission is used in Maruti Suzuki swift that used synchromesh gearbox, Honda city i-vtech comes with the epicyclic type automatic gearbox and Audi A6 is equipped with hydraulic type automatic gearbox. We have discussed here all types of gearbox that is used in transmission of a vehicle. If you liked this information than don’t forget to like and share. ← How Geothermal Power Plant Works – Explained?